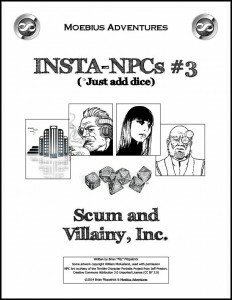 Insta-NPCs #3: Scum & Villainy, Inc. This little, system-neutral pdf clocks in at 8 pages, 1 page front cover, 1 page advertisement, leavintg us with 6 pages of content, so what do we get? It has happened to the best of us – DMing for years and then, suddenly – dry. No idea. We need a villain, but, due to real life issues or simple stress, the creative juices just won’t flow. This is where this pdf comes into the picture. While its introduction explains how to use it and we get some sample, developed stories, this pdf breaks villains down into components, which you role – archetypical components, if you will. These are Origins, Goal, Method, Role and Emotion. Each of the different aforementioned components is assigned a dice from d4 to d20; To create a villain’s personality-skeleton, if you will, you simply roll once on all of the tables and write down the result. From this framework, these scarce few words, one can easily craft a vast plethora of personas for just about any setting. Editing and formatting are top-notch, I noticed no glitches. Layout adheres toa printer-friendly two-column b/w-standard and the pdf comes with nice stock-art and has no bookmarks, but needs none at this length. Author Brain Fitzpatrick’s generator herein is pretty hard to rate – why? Because it does what it’s supposed to – admirably well. As a means of getting the creative juices flowing, this pdf is indeed a nice catalyst and is fully functional. That being said, it is also slightly less varied than I would have liked – a generator with character flaws, a despicable general ideological bent, things like that would have easily helped making the creative process even easier for the DM. Just a tad more depth would have made this, at least to me, even more useful. Hence, while not in any way shape or form bad, especially due to the low price, I will settle on a final verdict of 4 stars for a good, useful tool. You can get this nice generator here on OBS and here on d20pfsrd.com’s shop. Thank you so much for the great review and I will definitely look at adding some additional crunch in a future revision!